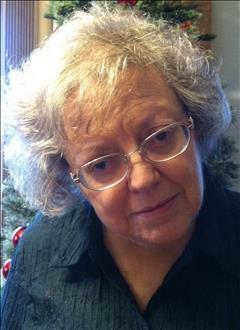 Diane T. Riesenberg, 73, of Fort Dodge, passed away on Thursday, February 7, 2019 at the Marian Home. Funeral services will be held on Wednesday, February 13th at 10:00 AM in the Chapel of the Laufersweiler-Sievers Funeral Home and 10:30 AM at Corpus Christi Church with Msgr. Kevin McCoy officiating the Mass of Christian Burial. Burial will be in Corpus Christi Cemetery. Visitation will be on Tuesday from 4:00 to 7:00 PM, with Rosary Prayed at 4:00 PM and Vigil Prayer at 7:00 PM all at Laufersweiler Funeral Home. Survivors include her husband of 51 years, John; daughter, Theresa McClintock and her husband Steve of Fort Dodge; siblings, Darrell Lohman of Lidderdale; Ron (Colleen) Lohman of Algona; Rob (Gordon Cantiello) Lohman of NE; LouAnn (Verle) Ayres of NE; Randy Lohman of Carroll; and Joani Lohman of Paton. She was preceded in death by her parents, Marcellus "Bill" and Bertha (Brinks) and a sister, Karen Lohman. Diane Theresia Lohman was born on May 9, 1945 in Carroll, IA. She was raised in Lidderdale and graduated from Kuemper Catholic High School in 1963. She then attended Iowa Central Community College. On June 24, 1967 she was united in marriage to John Riesenberg in Lidderdale, IA. In 1970, the couple established their home in Fort Dodge. Diane worked various jobs including 13 years at ICCC Library until retiring in 2000. For many years Diane was active with the ICCC Comedia Music Players. She enjoyed scrapbooking and collecting Precious Moments statues. Diane was long time member of Holy Trinity Parish. Memorials may be left to Breast Cancer Awareness or to the Parkinson Foundation. "Ann and I send our sympathy to all of you during this time of sorry in your loss of Diane. Our prayers go out to her." "John I am so sorry to learn of your wife Diane?s passing. I will keep you and your family in my thoughts and prayers. May Diane Rest In Peace. Bob Adams"
"Sorry for your loss. Had lots of fun with Diane in Comedia. She a sweet heart and loved being in the shows. " "So sorry for your loss. You have my sympathy." "Theresa I'm sorry to hear of the loss of your Mother. My daughter Tammi worked with you. Tammi LeTourneau Hart. May she R.I.P."